We had just come in from the garden and I was in a mood for a quick and light lunch. I thought what better way to use up some of the bounty we just picked from the garden than to lightly blanch them in a soup. 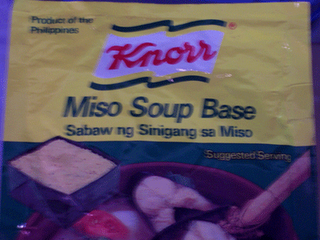 I was a bit disappointed when I looked in the pantry and discovered that I was out of my usual sinigang mix with tamarind and all I had was this pack of sinigang sa miso mix. I decided to go ahead and use this mix instead anyway. What we ended up with was another pleasant surprise. All I did for this soup is to boil about 6 cups of water and add about half of the pack of mix, then added the shrimps and vegetables. 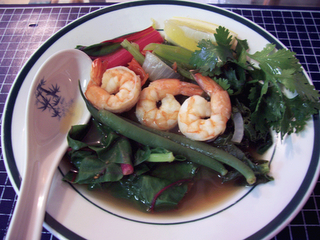 As soon as the vegetables were cooked, we had our delicious and healthy soup! Lunch in less than 30 minutes. 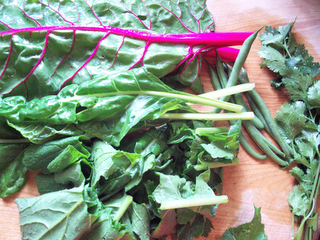 Vegetables we used: swiss chard, turnip greens, green beans and topped with sprigs of cilantro or coriander. Hi Tin! Yes, galing lahat sa garden namin. I haven’t bought hardly any vegetables the past month. We have just been eating from our garden. I love it! Hi Rowena, take a peek at our garden here. I can’t keep up with you – palagi kang busy sa kusina no wonder why – look at your new blog skin, love it! Sarap ng gulay -galing ba yan sa garden mo? Oh I wish you had a pic of your garden! It’s the one thing that we didn’t have time to put into this year…for sure the next!